Dan and I made the cover of the local section of the Chestnut Hill Local. A big thank you from both of us to Kristin Pazulski for taking the time to tell our story and to the Local for shedding light on our project. We met with Kristin twice at McNally's Tavern. I had a Schmitter and water while Dan had a burger and a glass of wine. CLICK HERE to watch this scene on You Tube. Dan was born on May 9th. His girlfriend was born on May 10th. They celebrated their double birthday at Dan's favorite restaurant, Halligan's Pub. A very special thanks to Joe Halligan and the entire staff who treat my brother with love and respect on a weekly basis. Find out more about Halligans CLICK HERE. Below is a composite made from the three birthday cards Dan made Sarah from scratch. I'd also like to point out that Dan has never liked being called "Danny". Since we were young he has reacted rather negatively to those who try to call him anything other than "Dan". I can't blame him. I am the same way when someone assumes they can call me "Bill". With a last name like ours, it's only natural we take names and labels to heart. Dan, however, takes exception to this when it comes to girls. 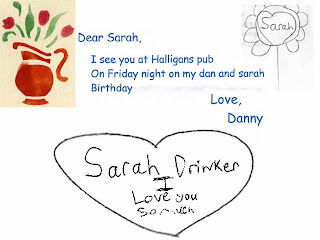 If he's trying to be endearing, like in all three cards he made for Sarah, he will sign "Danny". In the scene above, when Sarah reads "Love, Danny" she pauses and exclaims "Cute!" I guess he knows what he's doing.